We generally operate off the principle of Process over Product here. 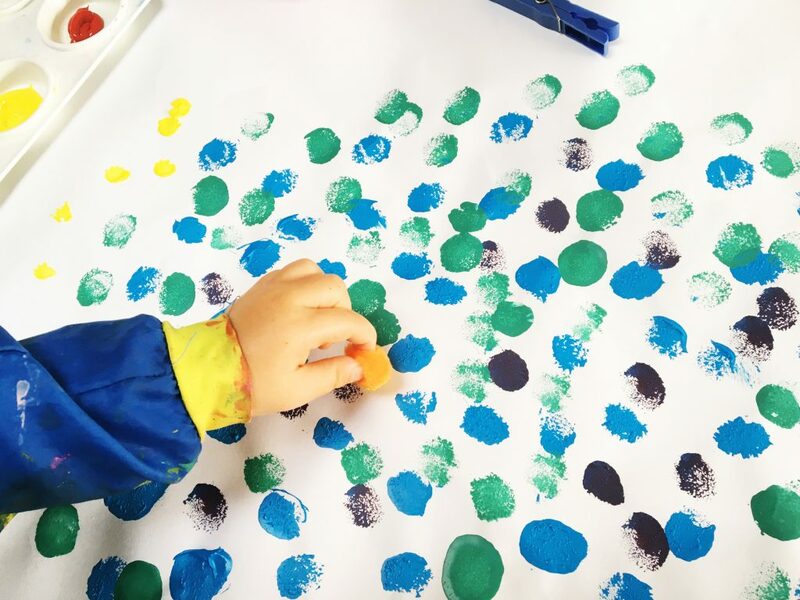 When it comes to painting, it’s all about Little Miss having fun. Let her create and explore as she pleases. Every once in awhile though, I do like to guide the process to prevent the seemingly inevitable khaki green/ brown puddle. Let the record show that I am not an Art Expert. 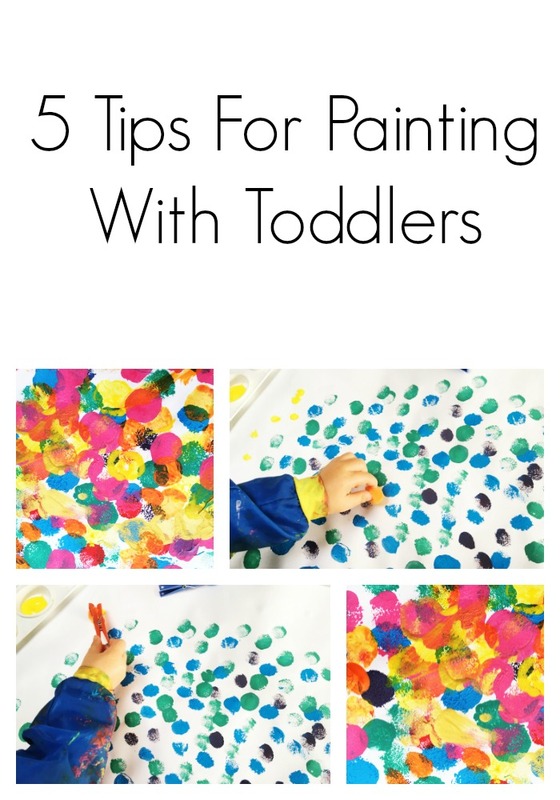 These are just some of my tried and true tips for painting with a toddler that I have gleaned from many a paint session. This makes me sound like some kind of Artistic Scrooge. 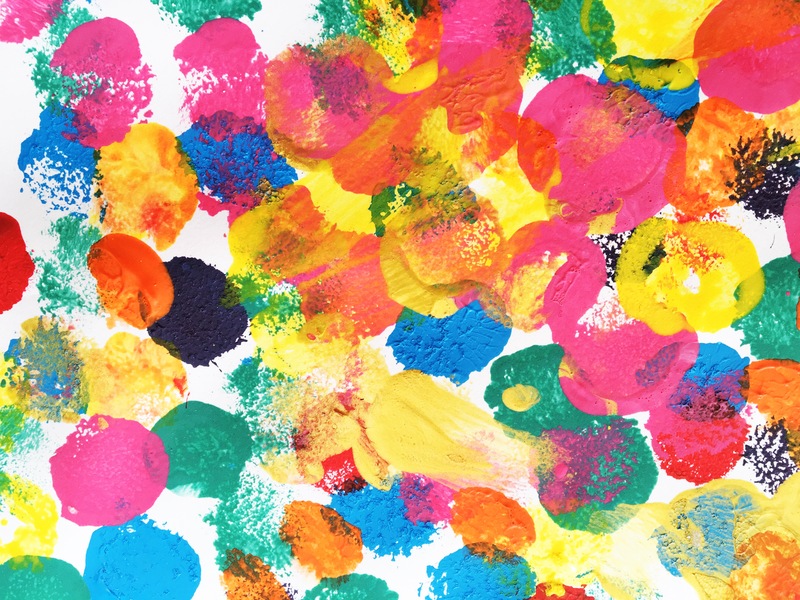 My toddler LOVES colour-mixing. Back in my rookie days, I would fill the palette with many colours because RAINBOWS. Then I would lament the fact that ALL the colours were mixed together to make brown. Flattering. The trick is to use complementary colours. So for this artwork, we started with blue. We did lots of blue dots. Then we experimented with mixing blue and yellow to make green dots. Then we mixed blue and red to create purple. Once we filled the page with blue, green and purple we ended that paint session and set the masterpiece aside to dry. A few days later, we added another layer of paint. This time we started with yellow dots. Then we experimented with adding red to create orange. We finished this layer off with some red dots. Then we set it aside to dry again. A week later, we came back to the artwork and added some pink dots and gold. I think that this part of the process really helps to create colourful art pieces. I am the Queen of setting up paint activities and letting my toddler just do her own thing. Every now and then, I try to show her a new way of doing things. 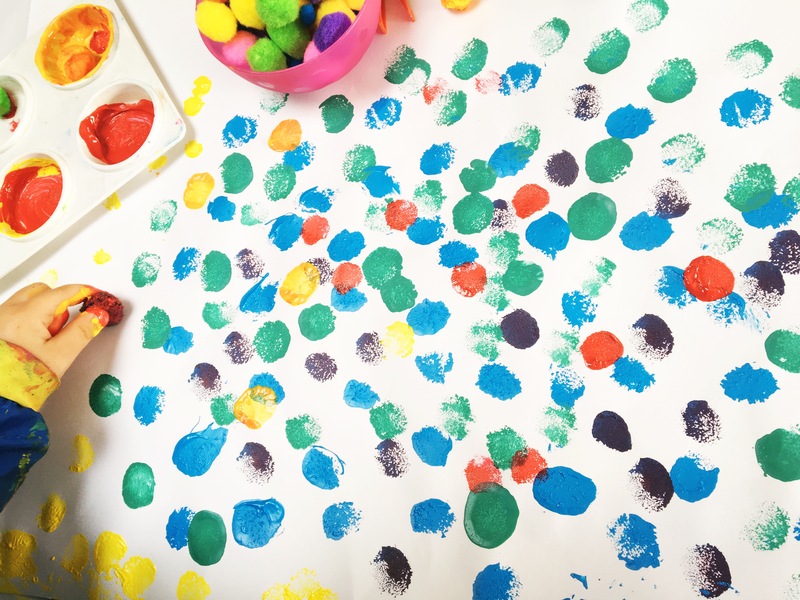 So in this activity, it was all about using pom poms to create dots. So for part of the process, I worked alongside her, talking with her about the effects we were creating. Getting your hands dirty is part of the fun! Painting is generally always a popular activity round these parts. 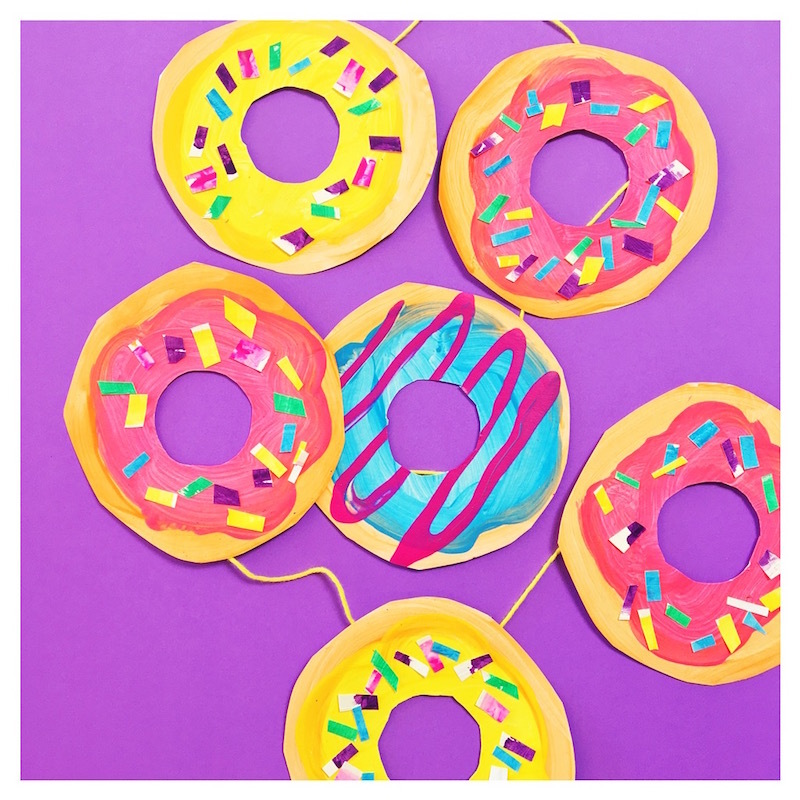 To keep things interesting, it’s fun to introduce different household items as painting tools. Use a peg to hold different sponges, leaves,whatever you can find! Any painting session here always has paper towels close by. My toddler is a huge fan of painting her hands. The dash from the table to the sink is slightly too far for my liking. So before the paint session begins, I fill a little tub with soapy water. As soon as painting is done, the masterpiece is whisked away and replaced with the water. I like to pretend it’s a seamless transition between painting and water play. Really it gives me the time to pack up the paint session whilst the toddler is occupied with water. This artwork is being turned into gift wrap. You could create birthday cards or frame part of the painting as a gift. 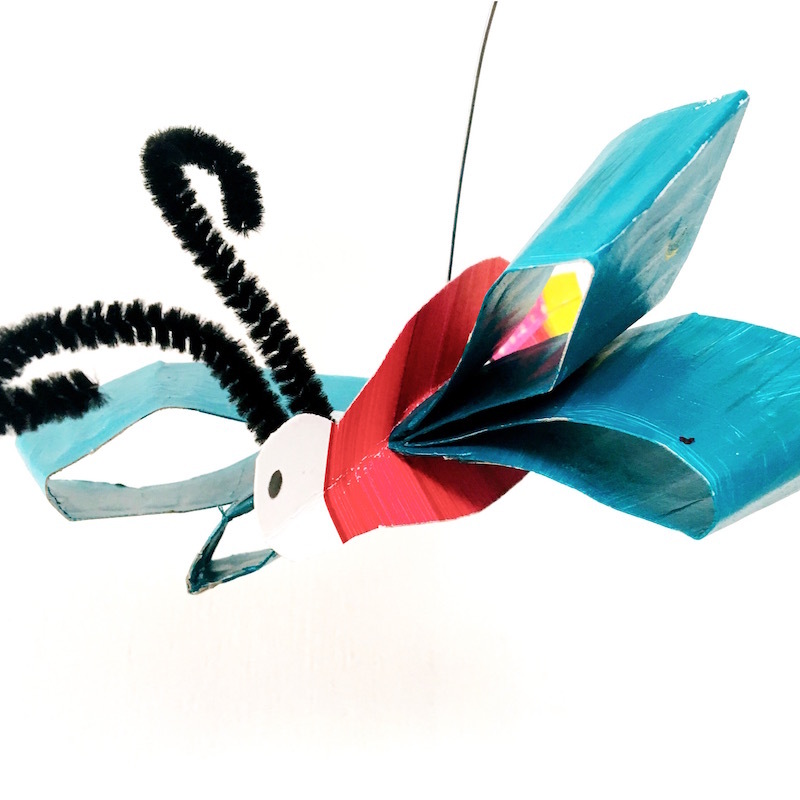 Here are 7 other ideas for re-purposing the kids’ art.